The breakfast room is now "green"
October goes very well with blue and white! It's always a great day -- the first ginger cookie of the season day! I'm sharing my tea with Sandi at Rose Chintz Cottage for Tea Time Tuesday and Bernideen for Friends Sharing Tea. 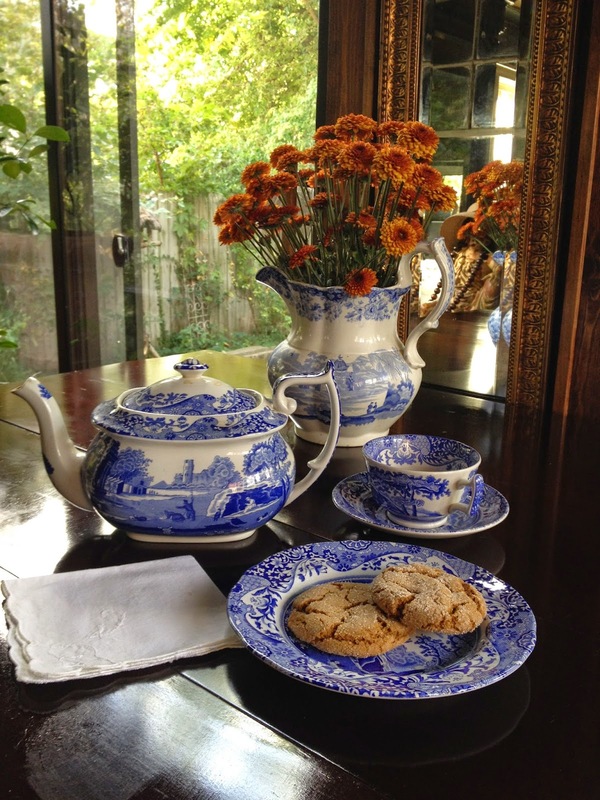 A lovely setting in blue and white with ginger cookies! Your mums look striking in the pitcher and I love your teapot! Thank you for joining me for tea and have a splendid week. I am so fond of pumpkin orange and blue in the Autumn - looks so beautiful! Orange and blue go beautifully together! Ooooh, ginger cookies and ginger mums! Hello Martha, thank you for having us over for tea. What a lovely setting. My heart was instantly transported. Hi Martha! Your blue and white tea is so pretty with those mums. I'd love to sit down for some ginger cookies. Have a great week, and thanks for visiting my blog. Your ginger cookies look delicious. Blue and white go perfectly with the oranges and golds of the fall, don't you think? What a beautiful fall table and the whole display is wonderful! So glad you shared. I always love your sun porch and your transferware dishes! Martha, this is such a pretty vignette! And those gingerbread cookies look delicious!